Powers/Abilities: Mother Askani was possessed by a weakened and aged Phoenix Force, which granted her vast telepathic and telekinetic abilities, sufficient to physically pull beings from the past of one reality into her own and telekinetically disintegrate others at the molecular level. 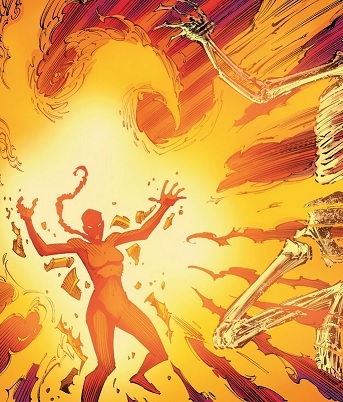 Her connection to the Phoenix Force kept her alive and without it, she perished. History: (X-Men '92 II#5 (fb) - BTS) - After the mutant Blaquesmith was taken in by Clan Askani, he was noticed by Mother Askani following his repair of the Clan's stoves and generators. He eventually became the right-hand man for Mother Askani. When the Askani learned that Apocalypse was returning from space, Mother Askani met with Mister Sinister with a plan to finally defeat Apocalypse and Sinister agreed to the plan, having desired revenge on Apocalypse for centuries. (X-Men '92 II#5) - Mother Askani used the Phoenix Force to pull Earth-92131's Cyclops and Jean Grey forward into her future of Earth-13393. When Cyclops and Jean awoke, they were surrounded by members of the Clan Askani and Mother Askani herself came forward. Jean recognized the Phoenix Force part of Mother Askani, who insisted the two mutant heroes call her Rachel, and Mother Askani explained that the two heroes had been pulled into the year 3992 and that she had used the Phoenix Force to summon Cyclops and Jean from Earth-92131's past. As Mother Askani led Jean and Cyclops to the other members of the Clan Askani, Cyclops noticed drawings of Apocalypse on the wall and Mother Askani explained that the drawings represented what was yet to occur on Earth-92131. Further explaining how Apocalypse had left Mister Sinister as Emperor of Earth, who had wiped out half of Earth's population, Mother Askani revealed that she had called out to the Phoenix Force for help and was given the power to summon Jean and Cyclops. Once she had regrouped with the other members of Clan Askani, Mother Askani introduced Cyclops and Jean Grey to Blaquesmith, a member of the Clan who would be accompanying them to Citadel Sinister. After first reluctant to help, Cyclops ultimately agreed to help and the foursome were soon venturing into Citadel Sinister, where they were attacked by Sinister's Marauders. 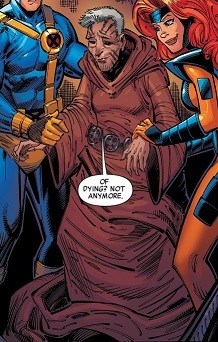 Following the mindless Marauders' defeat, Mother Askani slept at the heroes' camp while Jean learned more about Blaquesmith's connection to Mother Askani. The next day, Mother Askani and her allies ventured further into Citadel Sinister, where Mother Askani sensed life signs belonging to Sinister's horrifying, cloned Essex-Men. Upon defeating the Essex-Men, Mother Askani led Cyclops and Jean into a room where Blaquesmith sealed the door. Cyclops quickly began suspecting Mother Askani of having ulterior motives and, as if on cue, Mister Sinister appeared and revealed himself to be working with Mother Askani to finally defeat the returning Apocalypse. As Mother Askani watched, Sinister further revealed that the minute Cyclops and Jean had entered the room, his nanites harvested their DNA and created a genetic clone using their genetic material. When the clone was awakened and Cyclops and Jean recognized him as the man who would become their ally Cable, Mother Askani announced that her truce with Sinister had ended, and that she would be taking the clone, dubbed Nathan, with her and their truce would never be spoken of again. Before Mother Askani could go, Sinister offered to raise Nathan himself as an enemy of Apocalypse but Mother Askani exhausted her Phoenix Force abilities to destroy Sinister. Without Mother Askani's Phoenix Force powers to anchor them on Earth-13393, Cyclops and Jean Grey began to fade away as they returned to present-day Earth-92131 and Blaquesmith subsequently confirmed both the loss of the Phoenix Force and Mother Askani herself. Comments: Created by Chad Bowers, Chris Sims and Cory Hamscher. Blaquesmith was a mutant child whose family often raided the Clan Askani's supplies. When his family was caught, they exchanged their freedom for Blaquesmith, whom they had always somewhat shunned due to his mutant appearance. After Blaquesmith impressed Mother Askani by fixing Clan Askani's generators and stoves, he became the right-hand man to Mother Askani as she used the Phoenix Force to summon Cyclops and Jean Grey from Earth-92131's past. Blaquesmith was soon introduced to Cyclops and Jean and accompanied them as they invaded Citadel Sinister alongside Mother Askani. Once into the farthest parts of Citadel Sinister, Blaquesmith sealed everyone inside a room per Mother Askani's orders as Cyclops and Jean met Mister Sinister, unaware that nanites were harvesting their DNA. Blaquesmith then watched as the harvested DNA was used to create a perfect clone from the two mutant heroes' genetic material and Mother Askani exhausted her life destroying Sinister. 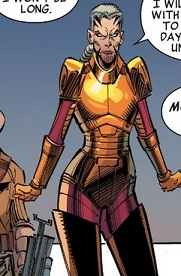 With Mother Askani now dead, Blaquesmith was tasked with teaching and training the new clone, dubbed Nathan. 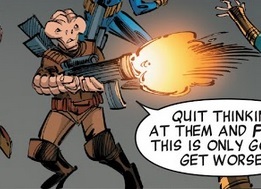 When Blaquesmith asked if Nathan understood that he was his teacher, Nathan asked when he would be able to get his first gun. Blaquesmith was a mutant with the ability to build virtually anything. Created by Apocalypse, Mister Sinister served Apocalypse for centuries and was eventually made Emperor of Earth when Apocalypse expanded his conquest into space. Having grown tired of servitude and desiring revenge on Apocalypse, Sinister's first act was to kill half of Earth's population and he soon set up a base in Citadel Sinister, creating his mindless clone Marauders and the mutant Essex-Men from the imperfect genetic material of past heroes Cyclops and Jean Grey. When Mother Askani learned that Apocalypse was returning from space, she met with Sinister and arranged a deal to bring Sinister perfect genetic material from Cyclops and Jean Grey in exchange for Sinister using it to create a cloned soldier capable of destroying Apocalypse. Mother Askani agreed and used her Phoenix Force abilities to bring Cyclops and Jean Grey from Earth-92131's past to Citadel Sinister, where Mister Sinister secretly harvested their DNA using nanites. He then used the material to create the clone, which he dubbed Nathan, but once the clone had awoken, Mother Askani announced their truce ended and demanded that Nathan accompany her back to Clan Askani. When Sinister tried to convince Mother Askani to let Nathan stay with him to be raised, Mother Askani exhausted her Phoenix abilities to destroy Sinister.